FastDomain - Enabling SpamExperts Quarantine Reports. SpamExperts has quarantine reporting turned off by default, so it must be turned on after logging into the Dashboard. Click the SpamExperts tool, located in the Mail section. Click Manage, to the right of your Domain Name, to login to the SpamExperts Dashboard. 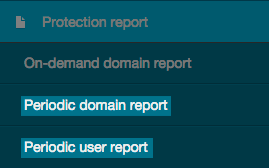 Under Protection Report choose either the Periodic Domain Report or Periodic User Report. Enter an email address where the reports will be delivered. This address does not need to be associated with your hosting service. Choose how often the reports will be emailed to you, either daily or weekly. Choose the Format for the report. This can either be HTML or a PDF. Choose if you would like to include the Extra spam table in the report. The Extra Spam Table feature is used for the PDF report option and when enabled it provides an extra column listing the messages that were rejected but not placed in the Quarantine. Sends a report for all message for a specific email user. If multiple email users have already been added through your Manage Email Users page, you can click enable to automatically activate user reports for all recipients. Click Add recipient to be directed to a new page. Enter the user's email address. Click the Update enable to begin sending the reports. SpamExperts will begin sending you reports based on the frequency specified.